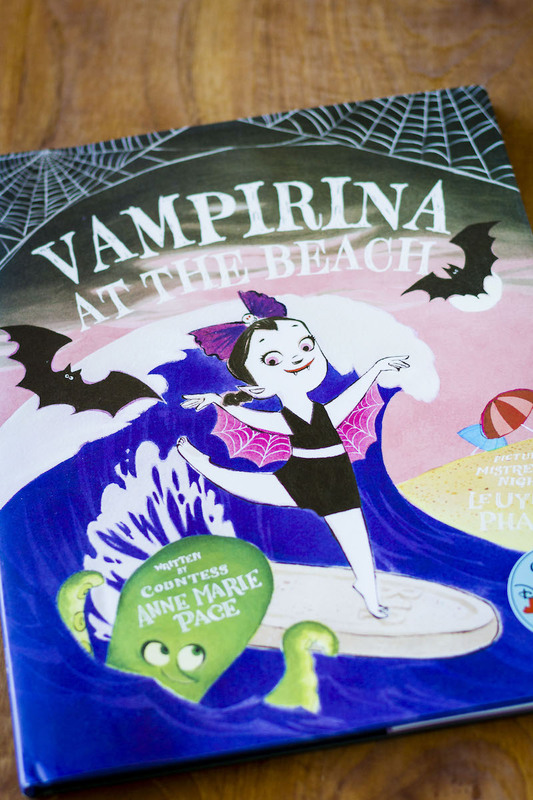 Thanks to Disney-Hyperion for sending me a copy of Vampirina at the Beach and for providing a prize pack! 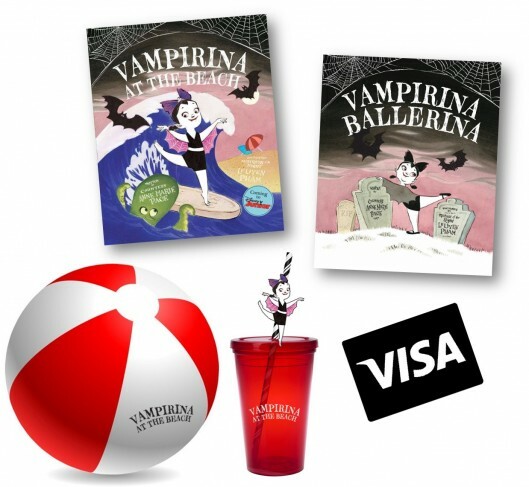 With her signature poise, Vampirina and her clan gear up for a festive time at the beach. Keeping her ballet lessons in mind, Vampirina demi-pliés on a surfboard, leaps for a volleyball, and finishes each competition with style, even if she doesn’t always come out on top. 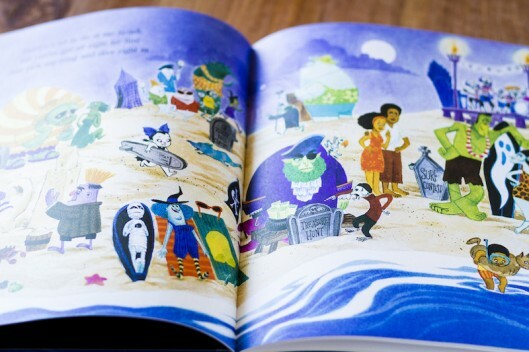 Vampirina At The Beach (Vampirina Ballerina Series) was just recently released and is perfect for enjoying with your 2-6 year old! plus a $100 Visa gift card for a dreadfully fun family night out! To enter, share where you’d like to head to for your dread-fully fun family night – the beach, the city? 1. Leave a comment. Share where you would head to enjoy your Dreadfully Fun family night! One (1) Dreadfully Fun Prize Pack, as described above. This giveaway ends at 11:59pm on Friday, 5/5/17 and is open to all U.S. residents 18 years or older. Prizing and samples provided by Disney-Hyperion. I’ll use And the Winner Is to select the winning comment. Winner will be notified by email and listed on my Giveaway Winners page. Winners must respond within 48 hours of notification to claim their prize. Good luck! Thank you to HarperChildrens for sending me copies of Stick Cat: A Tail of Two Kitties and Olga and the Smelly Thing from Nowhere and providing the prize pack! Being an avid reader myself, I’ve been on a mission to raise readers since even before my oldest was born. That doesn’t mean it’s been smooth sailing. It’s taken some coaxing, and even medical intervention for one struggling child. 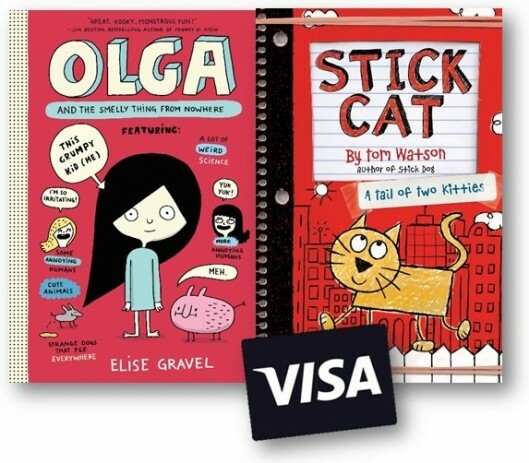 Find reading material that’s the appropriate reading level and engaging can be difficult, which is why I’ve always loved books like Stick Cat: A Tail of Two Kitties and Olga and the Smelly Thing from Nowhere. They’re perfect for that in between stage where picture books are a breeze but chapter books filled with page after page of solid text are overwhelming. 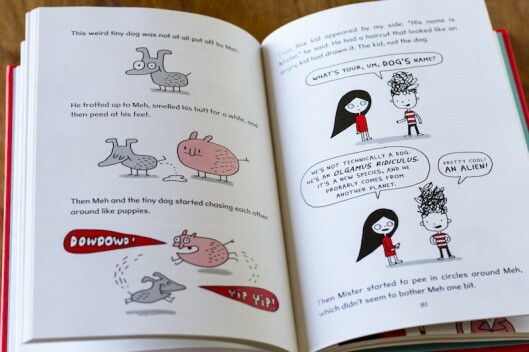 My 9 year old was thrilled when I handed him the Stick Cat book — he’s a big fan of the Stick Dog series. And my 10 year old sped through the Olga book in no time. 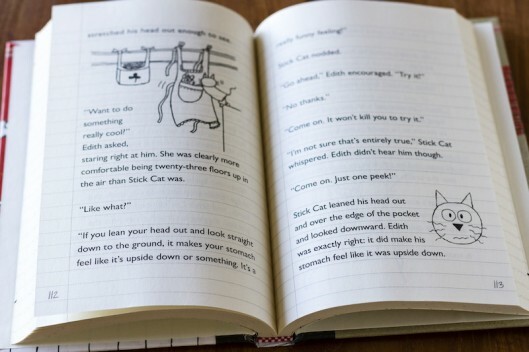 Perfect for fans of Diary of a Wimpy Kid, Big Nate, and animal lovers everywhere – meet Stick Cat! A heavily illustrated young reader series, from the author of Stick Dog — Tom Watson! Your young artist can even learn how to draw Stick Cat! 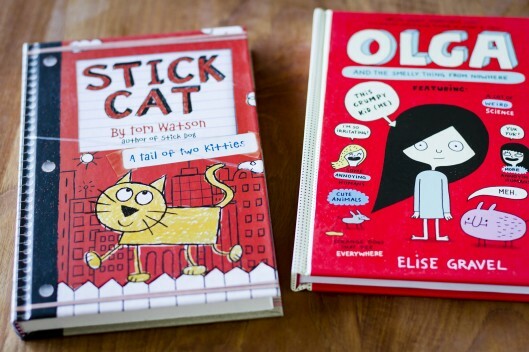 In the first adventure (available now), it’s a big day in the big city for Stick Cat and his best friend, Edith. There are treasures to hunt, songs to sing, pigeons to catch, and naps to take. But way up on the 23rd floor, danger lurks just around the corner. Terrible noises and violent crashes trap a desperate man in the building across the alley. Stick Cat will need to navigate his way across the alley — and around Edith’s peculiar ways — to attempt a rescue. Check out the official Stick Cat site. Perfect for fans of Dear Dumb Diary and My Big Fat Zombie Goldfish, and great preparation for El Deafo, Roller Girl, and Smile, your reader will love Olga and the Smelly Thing from Nowhere. Your young artist can also learn to Draw Animals with Elise Gravel, too! Olga finds a creature in her garbage can one day, and all it says is “MEH!” It won’t eat, it won’t sleep, it snores, it stinks, and Olga studies it like mad. She adores it and eventually names it after herself–an OLGAMUS. A trip to the library reveals little, while a trip to the local shop proves successful when Olga discovers Meh’s favorite food is olives! These episodes take place over a few days in Olga’s never-dull life, and she manages to reveal a great amount of information not only about herself, but about everything from the scientific method and Jane Goodall and some of her favorite odd creatures to the ins and outs of friendship and every human’s use for living in a community. Check out the official Olga and the Smelly Thing from Nowhere site. $100 Visa gift card to keep growing your family library! To enter, share who you would like to go on your next adventure with — Stick Dog or Stick Cat? 1. Leave a comment. Share which animal you’d like to to go on your next reading adventure with, Stick Cat or Stick Dog. One (1) Stick with Reading Prize Pack, as described above. This giveaway ends at 11:59pm on Friday, 5/5/17 and is open to all U.S. residents 18 years or older. Prizing and samples provided by Harper Collins. I’ll use And the Winner Is to select the winning comment. Winner will be notified by email and listed on my Giveaway Winners page. Winners must respond within 48 hours of notification to claim their prize. Good luck! Looking to improve your sleep? Let me introduce you to a company that can help you bring bedtime to the next level. Brentwood Home has an amazing array of mattresses, bedding, pillows and more. Not only are they beautiful and beautifully made, but they’re produced with healthy, natural materials that are safe for you and your home. I really think good pillows are something we often take for granted. It’s been many years since I’ve invested in a new one, and I’m totally kicking myself for not doing it sooner. I’ve slept like a dream ever since I switched to my Helena pillow! Oh, I almost forgot — right now there’s a Brentwood Home coupon available! Use promo code OURHOME at checkout to save 10% on your purchase. so you can sleep safe and sound. The winner will also receive two Carmel molded latex pillows that are bouncy, resilient, and molded to perfectly contour your head and neck. 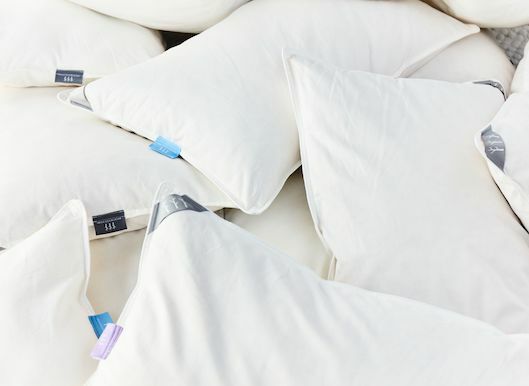 They’re made with healthy materials for your sleep, like a 100% organic cotton cover, and they’re certified free of synthetic materials by the Eco-institut. 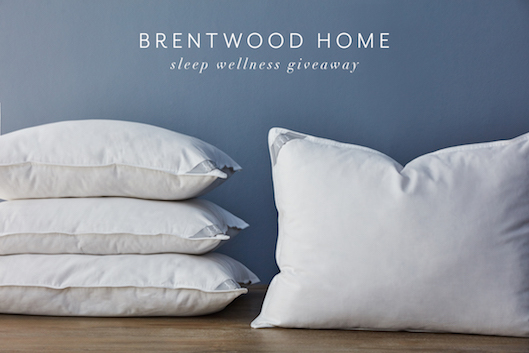 Win A Brentwood Home Sleep Wellness Bundle! To enter, share which other Brentwood Homes product you’d like to try in the comment section below! This post is in partnership with Brentwood Home. As always, all opinions are my own. Thank you for supporting the brands that make this site possible! Ladies, have you tried argan oil, yet? It has some truly amazing benefits, and I’d love to introduce you all to this high-quality organic brand. Aynara Beauty Organic Argan Oil is natural, cruelty-free, and vegan. It is rich in vitamin E, essential fatty acids, and proteins that work together to fight fine lines, repair skin imperfections, reduce acne, and deeply moisturize skin. And Aynara Beauty Organic Argan Oil isn’t just for skin use. It makes a great makeup primer that can blend out foundation, contour, and highlights to give a flawless, airbrushed look. A few drops can also work wonders on dry hair and split ends. 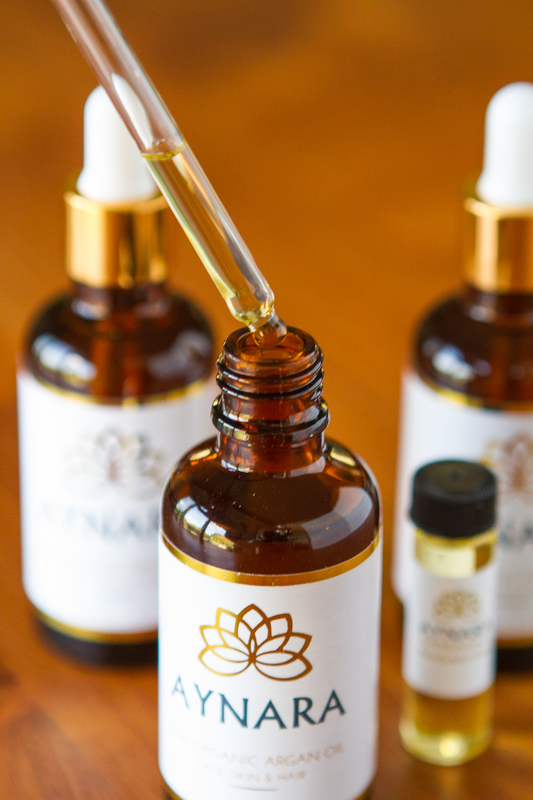 I have to say I’m a bit addicted to this stuff… Aynara Beauty Organic Argan Oil has such a wonderful scent, and I’m always a sucker for a fabulous multipurpose product. I apply it to my face at night before applying my moisturizer, and then I use any excess oil that’s on my hands on the ends of my hair. I also use it on my lips and cuticles, and they’ve never looked better. You only need a few drops, so one bottle goes a long way! P.S. 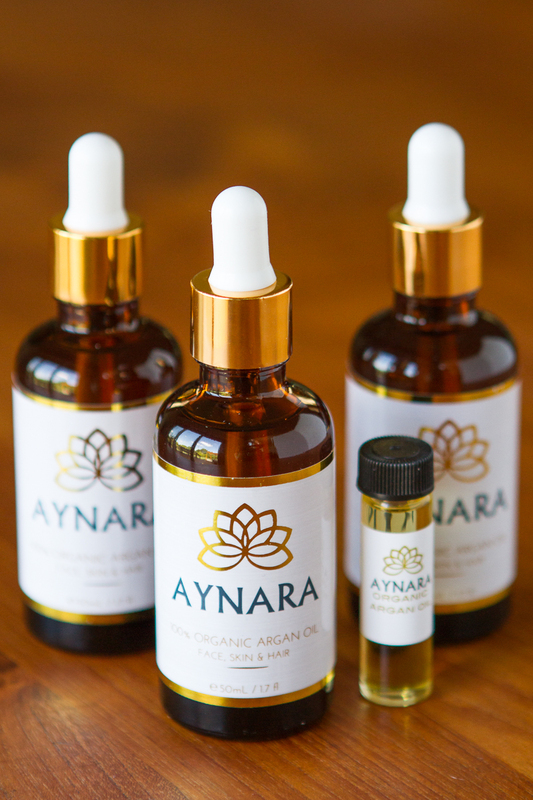 Aynara Beauty Organic Argan Oil would be a great Christmas gift for your fave beauty junkie! Win An Aynara Beauty Organic Argan Oil Gift Basket! One (1) lucky Deal Seeking Mom reader will win an Aynara Beauty Gift Basket, a $288 value! To enter, share which benefit you’re most excited to gain when you try Aynara Beauty’s Organic Argan Oil. This post is in partnership with Aynara Beauty. As always, all opinions are my own. Thank you for supporting the brands that make this site possible! I grew up near the Mid-Ohio Sports Car Course and spent many weekends there with my mom watching Indy car racing. But I never had the opportunity to see a NASCAR race. The Mid-Ohio Challenge XFINITY Series race has only been in existence for about four years now, and it’s been at least that long since I’ve made it back to catch a race. As a racing fan, seeing a NASCAR race is on my bucket list… Have you ever been? I know it’s loud, of course, but beyond that, I’m curious whether the atmosphere is similar to the Indy car races I grew up on. 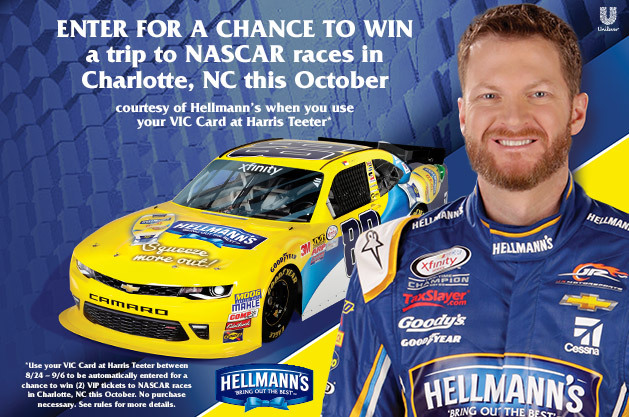 Either way, I’m super excited to be able to offer my readers a special NASCAR Gear Giveaway courtesy of Harris Teeter, Hellmann’s and Breyers, consisting of items autographed by Dale Earnhardt Jr.! To enter, just head over to the Deal Seeking Mom Facebook page through Friday, September 9, 2016 at 11:59 pm CT and follow the instructions. 14 lucky readers will win! In the meantime, be sure you’re signed up for a Harris Teeter VIC card to receive members only discounts, coupons, and a special item of the week!